Sometimes I am inspired by another artist's painting, try to do something "like" it, and end up nowhere even close! 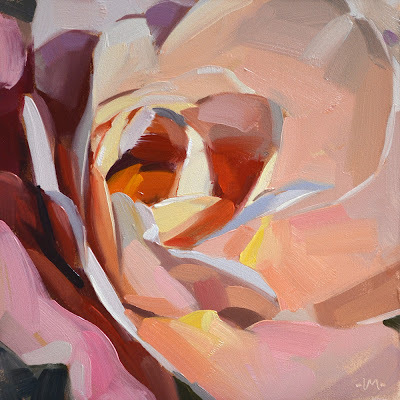 I really liked yesterday's flower painting by Carolee Clark. Specifically I liked the mosaic effect. So today I shot for more of a mosaic-y feel. I'm not sure I quite got there, but I do like the result. Along with less guilt (yesterday's post) I am also shooting for more experimentation and risk. If I look back at the things I've done in the past that ended up being pretty cool, they all came from stepping out of my comfort zone and taking risks. I vow to be more daring! I've gotten way too comfortable! This is fabulous Carol! Love it! such lovely peachy interior colors and great sense of bright sunlight! Oh, Carol, this rose is amazing! Such luminous light! I have to admit i rarely have the time to open your blog post emails (or 80% of the rest in my inbox) but tonight i think i struck it lucky! I love what you're saying about taking risks. That's so true. And even though this doesn't really look 'mosaic-y', you've caught the colors and vibrancy of this flower perfectly. And I love the 'in-your-face' composition. I can almost smell it! Carol, this is SO striking! the light is phenomenal...the strokes, pure. wOw. It's beautiful and still very you! This is wonderful , the variations of color and value really keep my eyes moving through it. You are so right about stepping out of CZ. Like Patti Mollica says " Life begins at the end of your comfort zone". Yumm! Really like this one. Love it! Keep having fun! I can especially appreciate this since I have some yellow roses in a vase on my kitchen table. You capture the subtlety of color and shape so well. You do such a great job with roses, I have painted a few and find them pretty challenging. That's a reason to paint them, right? The coral is just so pretty.. Simple yet elegant..
Wow, love the colors and the luminous quality you captured. If it was a risk I would say it was a risk worth taking.